During the awards gala on the night of April 4 in London, England; Fundación Karisma received the award in the category of Digital Activism where he shared a nomination with Mohammed Al-Maskati from the Middle East and SFLC.in from India. The award was received by Carolina Botero, director of the Colombian organization. Index on Censorship Freedom of Expression Awards exist to celebrate individuals or groups that have had a significant impact in the fight against censorship anywhere in the world and this year they award the only organization in Latin America and the Caribbean nominated. The prizes are delivered in four categories: arts, campaigns, digital activism and journalism. With more than 400 public nominations, the winners received their awards at a ceremony at the Mayfair Hotel in London, presented by comedian Nish Kumar and with music from the Congolese band Kasai Masai. In addition, winning individuals and organizations will become Fellows of the Index on Censorship Freedom of Expression Award and will receive year-round support for their work, including training in areas such as advocacy and communication. The winners are: the Kurdish artist Zehra Doğan (arts); Cartoonists Rights Network International, which campaigns on behalf of cartoonists from around the world (campaigns); Karisma Foundation (digital activism); and the Cameroonian journalist Mimi Mefo (journalism). In the past, famous characters have been recognized as Malala Yousafzai, a Nobel Prize-winning activist from Pakistan; Julian Assange of Wikileaks and the company Twitter in different categories. For Jodie Ginsberg, executive director of the non-profit campaign Index on Censorship “Freedom of expression is the cornerstone of a free society, and is increasingly threatened around the world. That is why it is more important than ever to recognize the groups and individuals who are willing to defend it”. The Karisma Foundation was nominated by Index on Censorship thanks to its work to combat digital trolls through the use of ingenious “stamps” that signal the abuse of the internet. Highlighting that it is an initiative that uses humor to draw attention to a serious problem: the increasing harassment of women online in Colombia and its chilling effect, making reference to Alerta Machitroll. They also recognize that the organization is a space to discuss human rights and technology issues in the country, which work through a combination of research, activism and digital tools. Another example of this work is the campaign “Sharing is not crime“, in which they promote open access to knowledge, therefore, the free flow of information, in the context of restrictive copyright legislation in Colombia. Carolina Botero, director of Karisma, affirms that “Internet is a great tool for freedom of expression. However, its increasing prevalence is not always linked to greater freedom of expression for all people. Karisma works to show how we can transfer and strengthen safeguards offline in the online world and to raise awareness about these issues”. She adds: “Regulation and repressive and regressive practices damage freedom of expression often in response to fear. At Karisma, however, our goal is to draw attention to the problems that are important for people like you and me, with solutions that strengthen rather than diminish freedom of expression. It is not an easy task, but this award tells us that we are on the right path”. Released from prison on 24 February 2019, Zehra Doğan is a Kurdish painter and journalist who, during her imprisonment, was denied access to materials for her work. She painted with dyes made from crushed fruit and herbs, even blood, and used newspapers and milk cartons as canvases. When she realised her reports from Turkey’s Kurdish region were being ignored by mainstream media, Doğan began painting the destruction in town of Nusaybin and sharing it on social media. For this she was arrested and imprisoned. During her imprisonment she refused to be silenced and continued to produce journalism and art. She collected and wrote stories about female political prisoners, reported on human rights abuses in prison, and painted despite the prison administration’s refusal to supply her with art materials. Cartoonists Rights Network International (CRNI) is a small organisation with a big impact: monitoring threats and abuses against editorial cartoonists worldwide. Marshalling an impressive worldwide network, CRNI helps to focus international attention on cases in which cartoonists are persecuted and put pressure on the persecutors. CRNI tracks censorship, fines, penalties and physical intimidation – including of family members, assault, imprisonment, and even assassinations. Once a threat is detected, CRNI often partners with other human rights organisations to maximise the pressure and impact of a campaign to protect the cartoonist and confront those who seek to censor political cartoonists. Fundación Karisma is a civil society organisation that takes on online trolls by using witty online ‘stamps’ that flag up internet abuse. It’s an initiative that uses humour to draw attention to a serious problem: the growing online harassment of women in Colombia and its chilling effect. The organisation offers a rare space to discuss many issues at the intersection of human rights and technology in the country and then tackles them through a mix of research, advocacy and digital tools. Karisma’s “Sharing is not a crime” campaign supports open access to knowledge against the backdrop of Colombia’s restrictive copyright legislation. Mimi Mefo is one of less than a handful journalists working without fear or favour in Cameroon’s climate of repression and self-censorship. An award-winning broadcast journalist at private media house Equinoxe TV and Radio, Mefo was arrested in November 2018 after she published reports that the military was behind the death of an American missionary in the country. Mefo reports on the escalating violence in the country’s western regions, a conflict that has become known as the “Anglophone Crisis” and is a leading voice in exposing the harassment of other Cameroonian journalists, calling publicly for the release of those jailed. 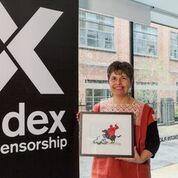 The Index on Censorship Freedom of Expression Awards recognise those individuals and groups making the greatest impact in tackling censorship worldwide. Established 19 years ago, the awards shine a light on work being undertaken in defence of free expression globally. Often these stories go unnoticed or are ignored by the mainstream press. Through the fellowship, Index works with the winners – both during an intensive week in London and the rest of the awarding year – to provide longer term, structured support. The goal is to help winners maximise their impact, broaden their support and ensure they can continue to excel at fighting free expression threats on the ground.